Even if there is intelligent life out there, the distances between our worlds are too great for realistic travel. Although pictures like the ones above are helpful in showing the tight grouping of stars, they are also deceptive. They give people the false impression that stars are actually close together. This has misled some people to believe that interstellar travel (travel between stars) is a realistic possibility. In reality, stars are very far apart. There is so much space between stars that (on average) you could line up at least 100 million stars between each star. The reason these stars appear so close together is because these photographs had to be greatly overexposed to make the stars visible. If the true size of these stars were shown in comparison to their actual distance to the other stars, we would not be able to see them in these photographs. Our closest star (Proxima Centauri) is 4.2 light-years away. This means if you were traveling the speed of light (186,282 miles per second) it would take you 4.2 years to reach the star. Obviously, scenes from Star Wars and Star Trek that show hundreds of stars quickly flying past the spaceship are inaccurate. Even if a spaceship could fly at the impossible speed of light, it would still take (on average) over four years for the spaceship to pass each star. To help put things into perspective, let’s look at our space flights to the moon. Apollo 8 flew to the moon at the record-breaking speed of 24,593 mph. Even if Apollo 8 were structurally capable of flying to our nearest star, it would take 115,000 years to reach it. Then, of course, it would take another 115,000 years to return home. Obviously, this trip would take way too much time. It has been argued that if there are extraterrestrial societies out there, you would expect some to be primitive and some to be advanced. Therefore, they argue, there is a good possibility that some of the advanced societies would have spaceships faster than ours. Even if this were true, interstellar travel would still be unrealistic. Although distances between stars are very great, distances between galaxies are even greater. There is a tremendous amount of space between galaxies. These incredible distances have forced scientists to concede that intergalactic travel (travel between galaxies) will never be possible. Even if we could travel at the impossible speed of light, these distances are still too great. The chart above shows the vast emptiness of space between galaxies. As you can see, there is a great gulf of empty space between our galaxy (item 1), our nearest galaxy (item 2), and our nearest major galaxy (item 3). The distances from us to these galaxies are 170,000 light years and 2.3 million light years (respectively). These distances are so great that we didn’t even know that these other galaxies existed until this past 80 years. Up until then, we thought our galaxy (Milky Way) was the universe. 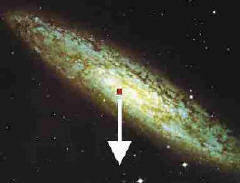 To help keep things in perspective, our huge galaxy is only one of over 100 billion galaxies.